Home / Why Invest In Gold and Silver? Has the same question ever occurred to you regarding currency – “why currency”? Currency is simply paper or a digital number. With great assistance from the actions of our governments and central banks, the amount of it in circulation is growing rapidly. The only problem is that the U.S. dollar itself is not backed by anything. It is a fiat currency, which means it’s based on trust and the market confidence in its value. The U.S. government has a yearly deficit spending of more than 1 (one) trillion dollars per year(! ), and increasing. In light of this, are you confident? Neither are we. Note. If you think the Euro is any better, think again. Euro, the 2nd largest foreign exchange reserve, is also a fiat currency, and most of the Euro-zone countries seem to continue presenting a deficit spending year after year. So, why gold? Gold is physical. Gold is limited. Gold is precious. Gold is money. The reason we can say gold is money is that it meets all of the below requirements of what money should be. Try the same exercise with currency, the “money” that you have in your pocket. A currency may comply with most of these requirements, but history shows, again and again, that it certainly does not fulfill the last one; to be a store of value over long periods of time. If you could choose today (which you can by the way…), what would you have preferred between storing $10,000 (or any other fiat currency), or storing $10,000 worth of physical gold, in which you could only go to pick it up in another 10 years’ time? By looking at the ongoing currency expansion between countries (also called the currency war), this question shouldn’t be too difficult to answer. In addition, precious metals happen to be in a very strong bullish cycle and trend, in which we believe it has not reached its highest point by any means. electronic item produced on the planet. Silver is widely used (consumed) in many industries; consumer electronics articles, solar-energy, RFDI (in the near future), and even the medical sector for its remarkable anti-bacterial qualities. Moreover, the shiny grey metal is rapidly gaining popularity amongst investors. We at GoldReference.com are very pro-silver, that is, physical silver. James Turk, the Chairman & Co-Founder of GoldMoney (www.goldmoney.com) puts it this way: “Historically, buying gold and silver has been an excellent way of preserving purchasing power over long periods of time.” He also explains that buying precious metals is not really an investment, but more of a placement. Gold (and silver) has no cash-flow as per a traditional investment, but it has a big flow of cash heading its way. And that in an ever-increasing quantity and speed. Gold is in the midst of a very bullish cycle and trend for precious metals and commodities in general. On the basis of relativity (though not nominally), we believe precious metals such as gold (and especially silver!) are still incredibly cheap. 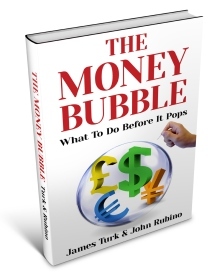 Many books have been written about gold and silver; this is the book to read, however. 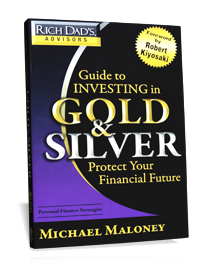 “Guide to Investing in Gold & Silver” by Mike Maloney, the CEO/Founder of Gold & Silver, Inc. (www.goldsilver.com), makes it easy for anyone to better understand economic history and the role of precious metals as money. With his many graphics and simple explanations Mr. Maloney brings you through the past, present and future of economic history and the precious metals market in an elegant way, explaining amongst other things the very important difference between price and value, currency and money. * Currency composition of official foreign exchange reserves: 61,8% of U.S. dollar and 24,1% of Euro. These numbers represent allocated reserves as of Q3 2012. Reference: For 1995–1999, 2006–2012: “Currency Composition of Official Foreign Exchange Reserves (COFER)” (PDF). Washington, D.C.: International Monetary Fund.